All in all, this article gives you a little background on the fearless, nutty goof-ball nerd that’s writing this blog. In my old age I’ve become relatively conservative (compared with earlier decades). Of course I realize that conservative is a relative concept. What’s conservative to me is certainly wacko to someone else. To each their own because that’s what makes the world interesting. After lusting for a computer for several years, I finally built my first computer from a kit in 1977. That’s right, I assembled it with my trusty soldering iron and a whole lot of time and patience. This was 4 years before the introduction of the IBM PC in 1981. Personal computers were just beginning with some of the key nerds of that time, people like Bill Gates, Steve Jobs and Woz. Too bad I never hooked up with them as I had the money to get Apple going. But I wasn’t in the right place at the right time (groan). They were in silicon Valley and I was in Southern California, a world apart. The 1977 computer I built was a Cromemco with a Z-80 CPU, 4 memory cards of 16K RAM each (total of 64K), 5 1/4″ floppy disk drive with 91K capacity (does anybody realize how small these figures are by today’s standards??? ), a Hazeltine smart terminal and a Digital Equipment DecWriter printer. The Cromemco was really cutting edge stuff at the time featuring many of the same components found on mainframe computers. My Cromemco computer had only 1 floppy disk drive as I didn’t see any need for a second floppy drive and it was really expensive (that was short-sighted of me). A hard disk drive was VERY expensive and only mainframe computers had them. It was two computers later before I had a hard disk drive. The Cromemco came in a big ugly black case that was large and heavy (13″ high x 20″ wide x 26″ deep and 36 lbs). It had 21 slots for the S-100 buss (that’s was really overkill). This computer continued to serve me well until I decided to buy a PC clone in 1983 . I spent about $5,000 on the Cromemco, which included all peripherals. The 16K memory cards cost me $500 EACH (I had 4 cards costing $2,000). Today a 16K chip (not a board, a chip) would cost about a buck. I doubt if you can buy a 16K memory chip anymore (insignificantly small capacity). If you can buy them, it’s probably by the pound. The $5,000 price tag in 1977 translates into more than $21,000 in today’s dollars. That shows the tremendous progress they’ve made in building cheaper computers. 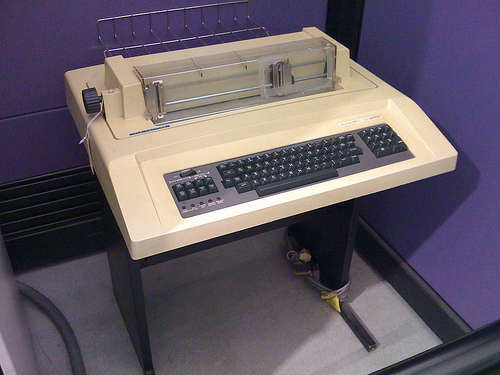 In 1977, there was no software available except the language that was used to program the computer (BASIC). All of the software had to be custom written by yours truly. To make things really challenging I didn’t know how to write a computer program, in fact I knew nothing about computers other than the fact that I wanted one. It would have been very helpful if I had taken a computer programming course in college but that never happened. I was a physics major and never had time for such things. Needless to say I was fearless in my approach and believed that I could teach myself how to do anything, just give me a good text book and a little time (that system worked in college as I never went to class). Eventually I sat down with my newly completed computer, a lot of programing books and spent 6 straight months (day and night) glued to the keyboard until the first program was finished. In those days the existing computer programing books were not very complete or instructive. They pretty much expected you to understand basic things about programing. They couldn’t have been more wrong in their assumption. Primarily the books were sorely lacking in explaining syntax command structure. For those unfamiliar with computer programing, correct syntax is paramount when giving instructions to a computer. Without correct syntax, the computer can’t understand the simplest command. Consequently, I spent a LOT of time using trial and error to find the correct syntax structure. I kept this up until each command functioned properly. After that it was simply a matter of putting it all together in a structured program that the computer would execute. Yeah it was a real piece of cake if you didn’t mind putting 100 hours per week into it. It’s a good thing I had good managers in my 3 Taco Bell restaurants because I was mostly absent from the business. The first program completed was a profit and loss statement for the Taco Bell restaurants. After that came a payroll check writing program, which was followed by the payroll report programs, which were due quarterly and yearly for both the state and federal government. What a time saver it was. I spent about a year writing these programs so that I could save a whopping 2 or 3 hours each month doing tedious business activities. It really was a great challenge and I triumphed in the end but I would never come close to recovering the time that I had spent writing these programs. But there was a side benefit because it did lead to some discoveries that were unanticipated in the stock market. My wife didn’t divorce me, but my life was threaten on many occasions. I also wore two holes in the carpet from rocking the chair back on 2 legs as I was prone to do when lost in thought. I spent a huge amount of time with that chair rocked back on two legs, hence the vaporized carpeting spots. Programing is 90% thought and 10% typing commands. The following picture is a page from a magazine advertising the Cromemco computer in 1977. By assembling the computer from a kit I saved about $600. The assembly procedure required me to solder every electrical component to the printed circuit boards. My 13 year old daughter helped me and she was a really big help too. She was fascinated by this enormous task that I had undertaken, but she also knew her father was nuts. Here are the two issues of Popular Electronics that started the nerds thinking about personal computers. These 2 issues ignited Jobs and Woz to form Apple (Apple was founded on April 1, 1976). Following is a picture of the monitor that I used (smart terminal monitor). It had characters that were displayed in dots and was really hard on the eyes. None of these pictures are of my original equipment, they are representative of exactly what I had. 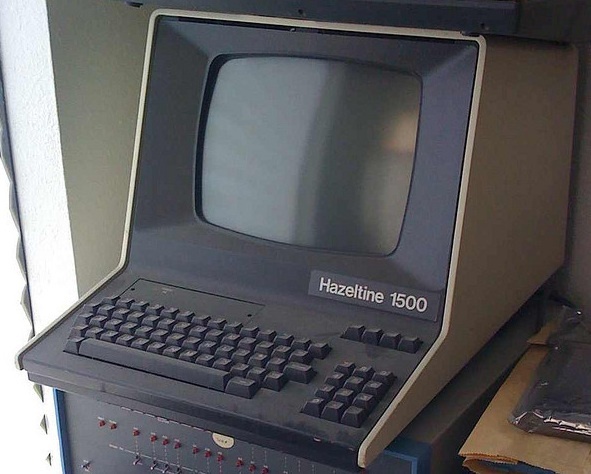 The picture of the Hazeltine monitor below is sitting on what looks like an old Altair computer. No programing on the Altair computer was possible other than the switches that you threw on the front panel. Now that was limited and archaic even for 1977. There were also computers that had cassette tape drives, just like the ones used by the music industry. The large open reel tape drives (seen on large main frame computers) were excellent. But the cassettes were prone to recording unreliable computer instructions and that never interested me. They were just cheap junk and were on low end machines never intended for business use.. The Digital Equipment DecWriter printer was so clatteringly loud that I installed it in a closet and kept the door closed. It was a dot matrix printer (remember them???) and printed at the blazing speed of 30 characters per second. That may sound fast but it took several minutes to print one page. Today my laser printer will churn out at least 12 pages per minute. I also had a 300 baud telephone modem for dial-up connection to outside computers, including mainframes. 300 baud is about 30 characters per second and it was agonizingly slow. The last dial-up modem that I had was 56K baud. Following that was cable, which is blazing fast in comparison. With a computer I thought I could undertake a lot of studies of the stock market that I never thought possible, plus I could program it to print charts. Here I went again, spending endless hours in front of the computer creating new programs. I was in so much trouble with my wife because I practically didn’t exist in the family anymore. I was just this blob that said “huh” to everything. Also, “Just tell me when dinner is ready and I’ll come”. “Yeah sure, get it yourself”. “Chrissi and I are going out to eat”. And so it went. She eventually murdered me, disposed of the body in the desert and I was replaced with a look-alike android that paid her more attention. Androids were really expensive in those days. Truthfully I was really lucky that I had an understanding wife as a lot of women would have really unloaded on me and I would have certainly deserved it. But she understood that I was different and had things that needed doing. With my new computer I kept thinking of more and more things to analyze that I would NEVER attempt by hand, things too tedious, long and prone to many errors. On and on it went with more and more creations involving the stock market. Most of these programs didn’t lead anywhere but they answered questions. In 1981 when the IBM PC came out, I was unimpressed by it but a couple of year later I did buy a PC clone with lots of bells and whistles that were lacking on the IBM PC. For the first time there was now software available for this useless pile of semiconductors called a computer. Computers are really nothing more than a large doorstop without the software. The Apple computer preceded the IBM PC but it had very, very little software available and this would remain true for a very long time. I vowed that there was no way I would ever buy an Apple computer because software is the heart and soul of a computer. When the original Mac came out, it did look interesting if you were into desktop publishing or something similar that involved graphics. My continuing direction was towards custom financial software that I wrote myself for my business and stock market analysis. There was nothing Apple had to offer that interested me. And so it continued for literally decades. Then one day I noticed that Apple was adopting the same Intel processor that the PC was using. Hmmmm, that’s interesting but it was still useless from a PC software point of view. But wait, Apple introduced “Bootcamp”, a method of booting your Apple iMac up into Microsoft Windows. Suddenly I was interested in an Apple computer because you had an Apple iMac plus a Windows PC rolled up into one machine. This sounded pretty good, I could use my Windows software on an Apple plus Apple had made great strides in introducing their own software and often it was easier and more reliable to operate than its Windows counterpart. Not long after Bootcamp’s introduction (2006) I went to my local Apple store and fell in love with an iMac. I bought it and proceeded to use it for my Windows applications and also Apple applications. Things were so good that after a year I had almost completely abandoned my Windows software. Better still, the iMac operating system was so stable that I never saw the blue screen of death or its related Apple counterpart (does it exist???). No rebooting because things froze up or whatever else that might go wrong with PCs. I now started talking to friends about my Apple computer and how they had to buy one too. I was the proud owner of an iMac and had become a full fledged member of the Apple club. These were unbelievable words coming from my month, an avowed hater of Apple computers. A year later I bought a MacBook Pro (laptop) and was now a two computer owner of Apple products. My Apple brainwashing was almost complete and evidently I was turning into a mindless Apple borg collective member. The Amazon Kindle came out and I had to have one, loved it but it didn’t do some things that I would like to see done by a small device like this. Boom, Apple announces the iPad one and it does everything the Kindle does and LOTS more. I quickly sold my Kindle on eBay before the iPad was introduced and Kindle prices started dropped because the world was going to wake up one day and realize that the Kindle wasn’t up to the job and expendable. I bought my iPad one on the second day they were available (Monday after Easter 2010). I was now a 3 computer owner of Apple products. It’s official, I was now and still remain an Apple zombie, “me want more Apples”. This entry was posted on January 13, 2018 at 2:50 PM and is filed under IN DEPTH, UPDATE. You can subscribe via RSS 2.0 feed to this post's comments. You can comment below, or link to this permanent URL from your own site.